John Deere complete gearcase that will fit a 48" 54" and 62" deck on a X400 & X500 heavy duty lawn and garden tractor. 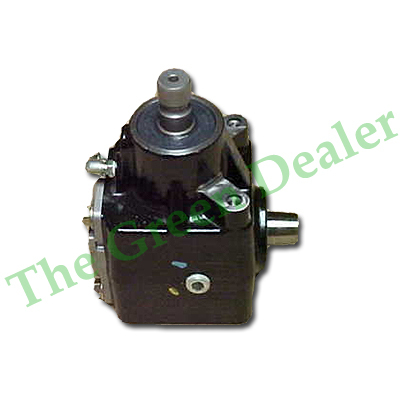 This gearcase is new in the box and comes with the John Deere 90 day part warranty. It will fit the following models with a 48", 54" and 62" deck. **This gearcase is shipped to you WITHOUT oil in it. 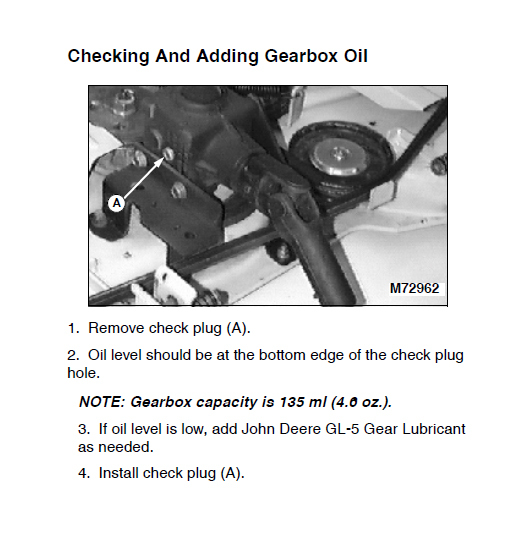 You will be required to fill the gearcase with oil before you mount it to your deck and use it. Failure to fill with oil will result in premature failure and will not be covered by warranty. Great price compared to local JD dealer. Delivery was fast. The original gearbox on my 62C deck had 6 bolts mounting it. This replacement only has 4. Bolts up OK but only time will tell how it holds up. I purchased this as a replacement for my 62C mower deck on a JD 2210 tractor. I saved over $250 buying from the Green Dealer and the part fit well. I had to grind a small notch out of the support bracket, but in 20 minutes it was remounted using the old gearbox's pulley, drive shaft, and bolts. Great buy. I have a JD 2305 small farm tractor. The belly cutting deck is called the Edge and is compatible with x400, x500. After checking with my local JD dealer and getting a price, I searched the internet for AM136330. I found ShopGreenDealer had this part for about half of what I could have paid. I ordered on a Thursday, received the next Monday! Installation was easy went well. I did pay $22 for a qt bottle of oil locally however I found my gearbox was pre-oiled. Yes, extremely happy with ShopGreendealer, deck is much quieter and performing well. Perfect part and exactly what I needed for less than half the price of everywhere else I checked. Came quickly. Website stated it shipped dry but was actually already filled with gear oil. Perfect replacement for the old one which blew a seal and demolished itself.